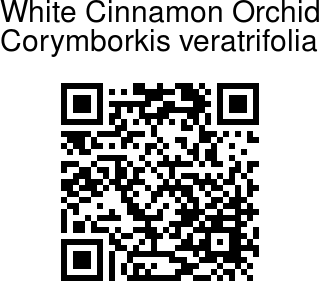 White Cinnamon Orchid is a terrestrial orchid and monopodial herb. 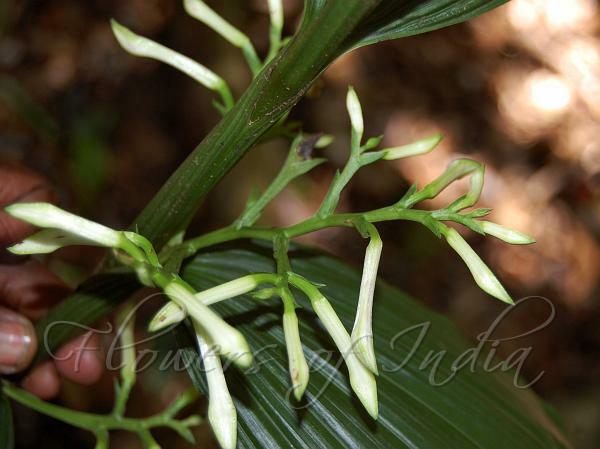 Leaves are 25-40 x 4-8 cm, plaited, elliptic-lanceshaped, tip with a tail-tapering, stalkless. White flowers are borne in panicles in leaf-axils, ip to 12 cm, bracts ovate-lanceshaped, up to 1 cm. Flowers are about 2.5 cm across, white, sepals and petals about 1.5-2 cm, linear-lanceshaped, lip clawed, column elongate, round, rostellum bifid, foot absent, pollinia 2, club-shaped. White Cinnamon Orchid is found in Eastern Himalayas, at altitudes of 700-1000 m, in Arunachal Pradesh, Assam, Meghalaya, Mizoram, Sikkim; Bhutan, Cambodia, Laos, Myanmar, Nepal, Sri Lanka, Vietnam, and probably also Southern Western Ghats. Flowering: June-July.